Do you need a credible company to conduct your interviews; do your short-listing and selection? Talk to us. For credit reports / Company Credibility assessment, talk to the GGEA for a comprehensive company screening of your future Business Partner. 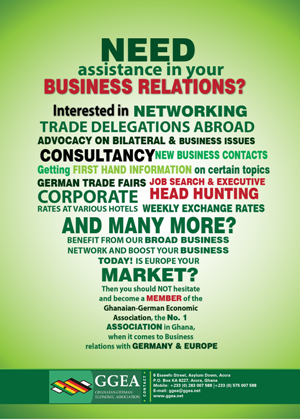 Are you in need of any Business contacts in Ghana or Germany? Select the industry and we will get you the required contacts. Gain direct access to prospective clients/customers easier and faster through our over 10,000 newsletter subscribers. Contact the GGEA for translation of Resume and other documents in German or English.